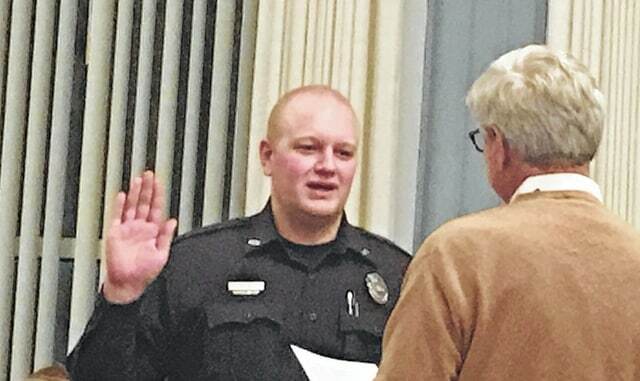 GALION — The Galion Police Department has a new officer. Andrew Rehm took his oath of office during the Galion City Council meeting Tuesday evening. Rehm, a 2012 Colonel Crawford graduate, has worked as a dispatcher for the Crawford County Sheriff’s Office since 2013 while obtaining his emergency medical technician (EMT) certification. He is also a volunteer firefighter. “He will be the only one I can think of on the force that will have his anniversary date on Valentine’s Day,” said Galion Police Chief Brian Saterfield. An ordinance pertaining to a new lease for the South Street Commerce Center, the former HTI building, was held to a second reading as city law director Tom Palmer said there may be a few changes to the lease before it is passed on the final reading. Ordinances pertaining to the lease of airport property and the adoption of a financial policy manual were also kept to second readings by council. An agreement between the city and the Galion YMCA for the operation of the Heise Park Pool will be similar to the agreements for the past few years. That ordinance was held to a first reading. Sukhdeep Mann and Andrea Wildenhaler were appointed to the city’s health board by council. “They will be excellent additions to the board of health,” said Mayor Tom O’Leary. The approval of the first reading of a CRA (Community Reinvestment Area) agreement between the city and Englefield Oil and the city will allow the company to renovate the current Duke gas station with a 50 percent tax abatement for eight years. The next council meeting will be held at 7 p.m. on Feb. 28 at the Galion Municipal Building.